A lovely sterling silver bangle that would compliment bridal wear beautifully elegant, contemporary and graceful. We love the Trixie solid silver bangle, handmade in the UK, the perfect accessory for your wedding dress! Simply stunning! The sheer elegance of the Malia solid silver bangle makes it the perfect piece of jewellery on your wedding day. Beautiful, curvy sterling silver torque bangle. this would look beautiful on your wrist on your wedding day, amazing bangle! 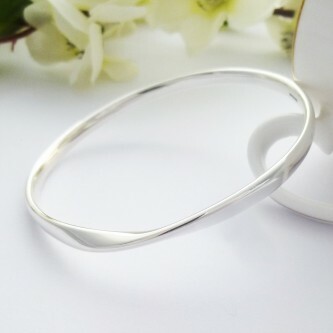 This simple, elegant and very beautiful solid silver bangle is the perfect accessory for your wedding day, gorgeous!